Make sure you quit safari before running that command. Ideally I'd love for an extension that allows me to click the RSS button, and subscribe with bloglines, like you can in Firefox. 8 people found this page useful, what do you think? Can't you just set bloglines to your default RSS reader in Safari's preferences? I have NetNewsWire Lite set as mine. When I click the RSS button, it launches NNWL and asks me if I want to subscribe. Eddie, I don't think bloglines has a plugin for safari, or am I missing something? sorry, I'm a mere mortal who's gotten pretty competent on a computer with no training. but obviously there are gaps. what does "type into terminal" mean when Safari is not operating? do I do that in explorer or where do I go to type it in. this RSS is driving me nuts plus Earthlink hinted that I've been hacked. They told me to change my password but nothing more helpful except that they did direct me to this web site when i e-mailed them. Help! Tina, "type into terminal" means that you need to launch the application named Terminal (located in your Utilities folder), type the command in, and hit return. This should be done while Safari is not running. 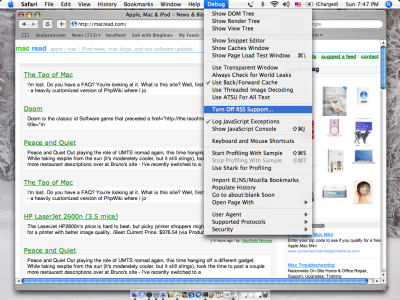 After you do the Terminal business, launch Safari and the Debug menu will appear. Eloisa, the instructions for enabling Safari's Debug menu are listed on this page and on the macosxhints.com web site that this page links to. But I will try to explain it even more simply. 1. Quit Safari 2. Open Terminal (located in the Utilities folder in your Applications folder) 3. Type the following into the Terminal window: defaults write com.apple.Safari IncludeDebugMenu 1 4. Hit Return 5. Quit Terminal 6. Open Safari The Debug menu should now appear to the right of the Help menu. From that menu there is a selection to "Turn Off RSS Support..."
So if the debug menu doesn't appear after you do that then what? i also encounter where after i entered the thread in the terminal, and then open safari, the debug tab is not in the toolbar...what to do? Which is slightly diff from the above comand. I have safari Version 5.0.3 (5533.19.4). finally works for me.